Our microfibre fabric is water absorbent, traps dirt and wicks moisture away from the body, making it extremely versatile for your craft projects. Have fun sewing your own tea towels, or take advantage of the breathable qualities of this microfibre material and create funky activewear. All printed with your unique designs to order. This mesh-like material is so versatile and is a favourite for crafts and DIY clothing projects. It's super fine and lightweight, so even though it absorbs water quickly, it dries just as fast too, an essential quality for any tea towel. Or you can make microfibre clothes for the gym or summer season; the open pique knit creates air holes making this is a breathable fabric. Fantastic choice of materials to print on and fairly easy interactive system for laying things out - once you got the hang of it. Very fast response - arrived two days after placing the order. Very pleased with results! It's super easy to clean, care for and maintain. If you're making your own tea towels, then the water absorbency and quick dry features mean you can easily reuse it a few times before washing, but as it traps dirt more effectively than other tea towels, you'll need to give it regular machine washes. Wash at 30°c, tumble dry on medium or hang dry, and iron on a low heat. What Fun Things Can I Make Using Microfiber Fabric? Who said practical house gifts can't be fun? 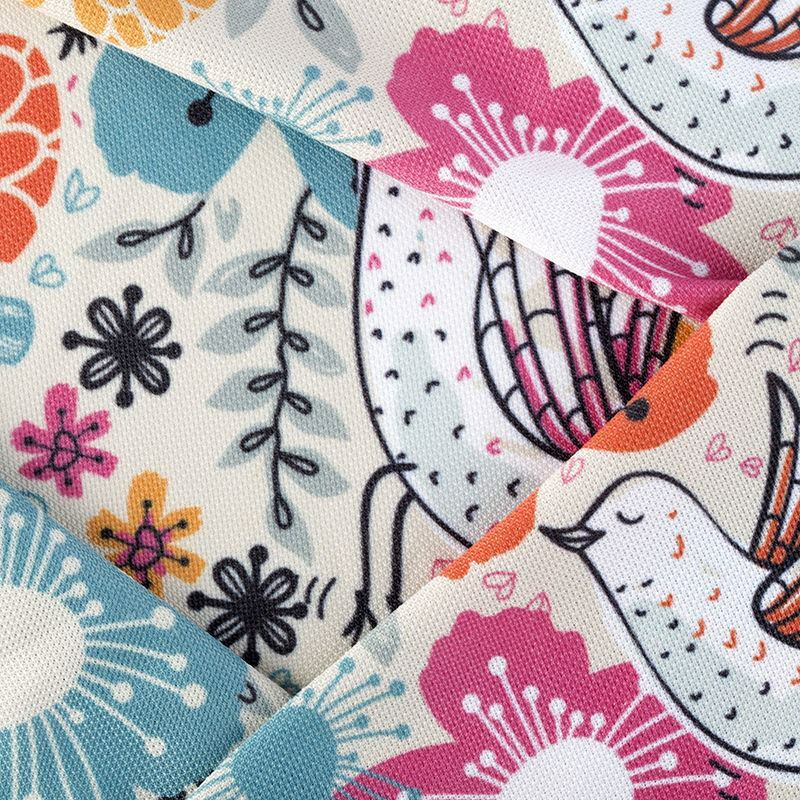 Design a quirky pattern or upload family photos and make a commemorative tea towel, tablecloth or table placemats. You can save them for special occasions or use them as your everyday table setting. Another great use of this fabric is to make microfibres clothes. If you've got a child who attends loads of after school clubs and sports activities, you can create a customised tank top that won't be found in the lost property. The beautiful drape and moisture wicking nature also make this a great material for summer clothing, such as a boy's polo top. The air holes let the skin breathe and the stretch in the weft allows for a generous give if your shirt pattern is more tight fitting. Have fun designing and working with this lovely microfibre material. Printing on microfibre is one of our specialities. Even though the air holes are visible and the weave is an open knit, your designs are crisp, clear and uninterrupted. Our specialist digital dye sublimation process fuses the ink to the fabric creating so it won't rub off or peel away. The natural base tone of our Boston microfibre fabric is slightly off-white, so deep, rich colours really hold their own. It's such a lovely material to work with thanks to the effortless drape and the way it glides over your skin - and the finished results are stunning. 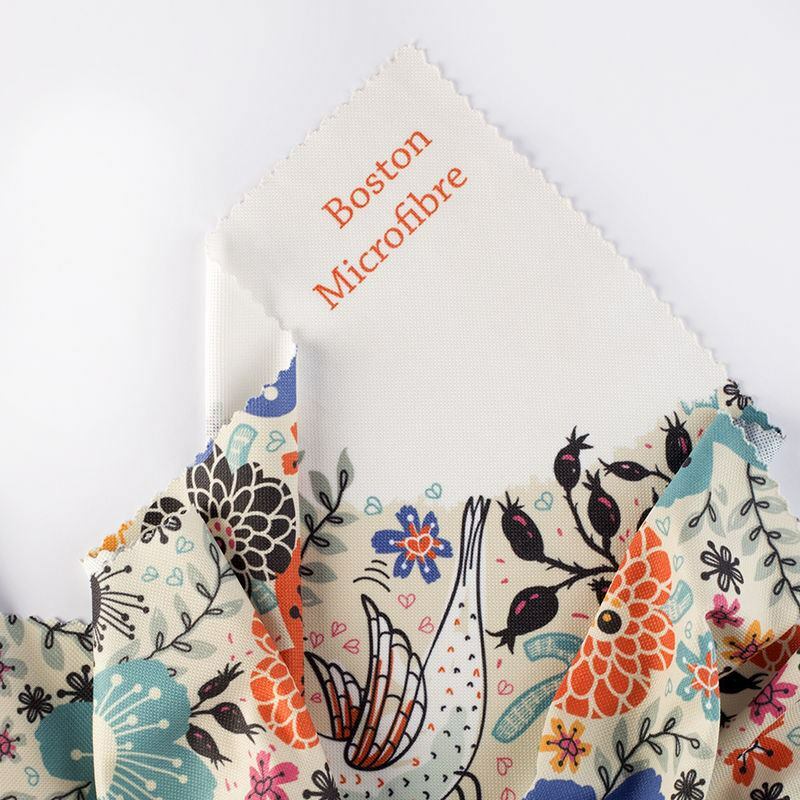 When you design your custom printed microfibre fabric, you have four edge finishing options: cut on the line for ultimate precision, hemmed with white thread, hemmed with black thread or simply left as it is with a rough cut. So if you've got a specific creative idea in mind and need it expertly finished, we can do it for you.